Whenever spring wants to begin, I'm ready for it! I've already been scouting plenty of outfits to wear when the weather finally warms up. One of the first items I look forward to wearing is different types of jeans...white jeans, lighter washes, cropped jeans, colored jeans, you name it. White jeans: Every woman should have a go-to pair of white jeans, whether they are cropped, skinny or boot cut. They essentially look good with any color top, but I usually go for black or a bright pop of color. Cropped jeans: I've been loving ankle length jeans to wear with flats or sandals. Typically I’ll pair skinny ankle jeans with a looser top, like a silk blouse or oversized light sweater. 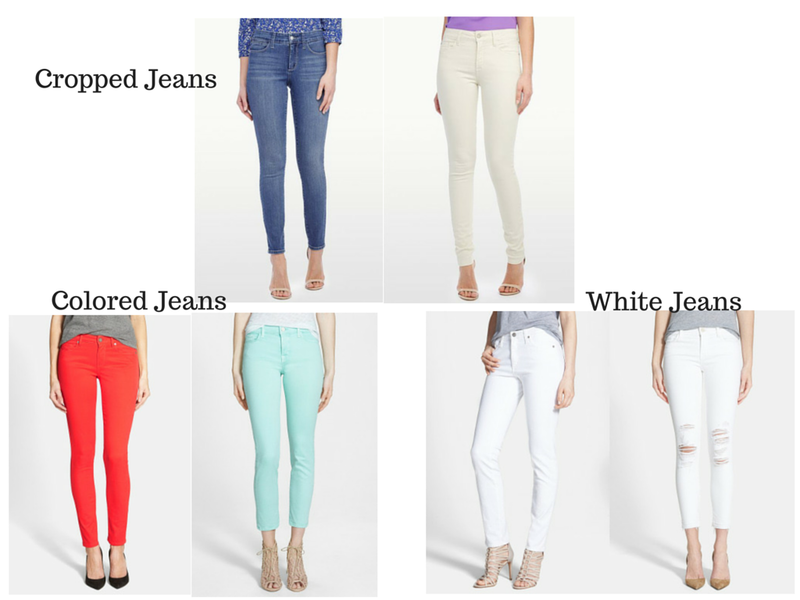 Colored jeans: These were a big trend a few years ago but I still love a few of my colored jeans. Some of the shades aren't as popular anymore, like the neon brights, but you could still rock basics like mint green, red or royal blue. I would definitely steer toward a neutral solid or patterned top with colored jeans. Definitely start with patience. Not every brand, cut or style works for everyone, but when you find one that works, stick with it. I recommend buying more than one pair of the same fit. I also used to think that designer jeans for women always ruled, but that’s not always true. Stores like Gap and J.Crew have affordable options that are good quality and on trend and you can get access to plenty of designer jeans for less at places like Nordstrom Rack, TJ Maxx and Marshall’s.